Log your Adaptronic ECU engine data, fused with GPS data to your android device. This is a simple and lightweight logger app. Keep it simple. One button starts and stops the logs. This is a simple and lightweight logger app. Keep it simple. One button starts and stops the logs. 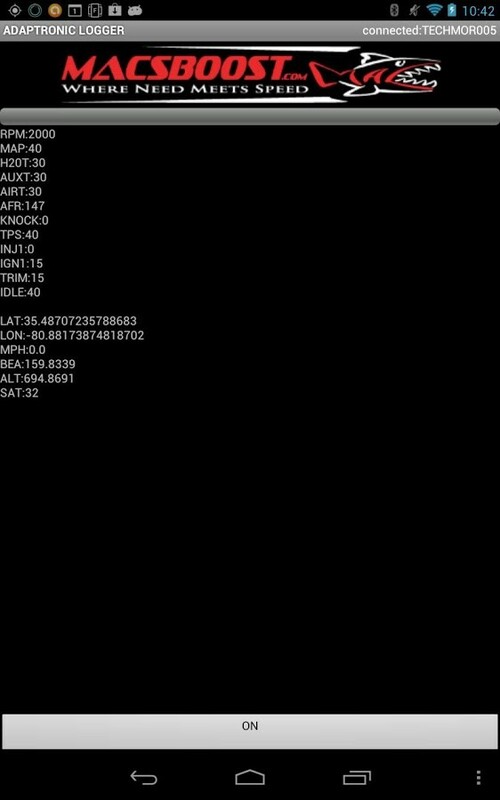 All recorded parameters are displayed as they are received on screen. The app uses a bluetooth to serial port adapter, programmed to 57600 baud. Built and tested on the nexus 7 but backwards compatible to android 2.3. A $10 ebay bluetooth serial adapter is all that is needed. These adapters will run on 5V and can be powered from the MAP/TPS supply. Look for the Bluetooth board with the two built in rs232 db9 connectors. For faster logging, not all normal WARI logged parameters are logged. Only the first 21 variables from the ECU are captured, then fused with the GPS data. More features/channels to come soon. Logs are saved to the com.macsboost.adaptroniclogger app directory and can be viewed on the android device with the document viewer or copied to a PC for analysis later. We recommend using the MegaLogviewer and the generated logs are designed for it. See the screenshot of megalogviewer (PC APP NOT INCLUDED) with example data recorder from the MACSBOOST Adaptronic Logger app. Future features will included google drive integration for auto syncing logs to your google drive! Accelerometer and gyro integration should be added shortly. Suggestions are encouraged, we want to make this app better!